Wouldn’t it be nice if you could just pop a pill and make your acne go away. Some products promise just that, but as the advertising usually says, “your results may vary.” Let’s take a look at some of the most popular acne pills and how they work. Taking Vitamin B5 pills is an inexpensive way to help treat acne. Acne pills offer nutritional supplements and herbs for acne skin care. 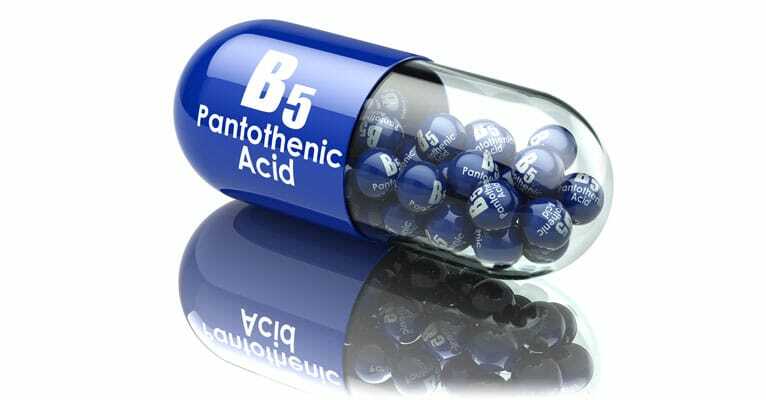 Vitamin B5, also known as pantothenic acid, often makes a real difference in treating acne. But you can get it for less than US $10 for a 30-day supply. There are several botanicals that help resolve acne, but you use them on your skin, you don’t take them in the form of a pill. Any product that fights “toxins” is probably a rip-off. Acne is not caused by toxins. You will get better results from treating your skin from the outside with a collection of skin care products such as Exposed Skin Care. The Acnepril acne pill promises a comprehensive approach to the causes of acne. Makers of the pill say it eliminates toxins. It provides essential vitamins and nutrients. And it provides a powerful antioxidant blend plus witch hazel to firm up your skin, all without benzoyl peroxide or salicylic acid and for as little as $79.99 a bottle. Wow! That’s a lot of healing in a single product! It seems almost too good to be true! And it is. For starters, the “toxins” that cause acne are inflammatory chemicals generated by the immune system itself, and they are generated in the skin. If you want to neutralize the toxins on your skin, you need to apply the product directly to your skin. You don’t need to take a pill. As for skin nutrients, there is a B-vitamin (niacin) deficiency disease called pellagra that can cause skin problems that are like acne but much, much worse. However, if you eat any kind of processed food in the USA, you get far more of this B-vitamin than you need. Niacin is added to any product that contains white flour. And you have to have both exposure to a fungus and the niacin deficiency to get this condition that nobody would confuse with acne. What about antioxidants, then? Green tea is a great antioxidant for the skin. It helps shrink the glands that make sebum so pores never get clogged in the first place. But to get this benefit, you apply green tea extracts to your skin, you don’t take them as a pill. Acnepril does not seem like a good value for US $79.99. But it’s not the only acne pill on the market. For just US $59.99, the Orovo Acne Pill promises to fight acne both inside and out. You don’t have rub the acne pills on your face. Orovo also sends you an exfoliating cleanser you can use in your daily skin care routine. But does it work? The Orovo Acne pill also contains L-carnitine, which does not do anything that harms or helps the skin. So why not plunk down your $59.99 for Orovo Acne Pills? The main reason is that you can get vitamin B5 for about $55 a bottle less and it will work just as well. And there are also better skin cleansers. With a name that sounds like an antibiotic, Acneticin promises to treat blotching, itchiness, and infected pimples. It promises to treat blackheads, zits, and persistent pimples, all from the “cellular level” of your skin. The main botanical ingredient in Acneticin is dandelion. The makers of Acneticin correctly claim that dandelion greens contain more calcium than spinach. Still, since there is only 225 mg of dandelion in the recommended four capsules per day, even if dandelion were 100% calcium you could only get 225 mg of calcium per day, about 20% of what your body needs—and calcium has no special role in fighting acne. The makers of Acneticin also claim that dandelion is a diuretic, which it is, and that this diuretic acid helps eliminate toxins at a cellular level, which it doesn’t. All a diuretic does is to increase urination. Cells don’t urinate. A diuretic does not magically draw toxins out of cells. This product won’t hurt your skin, and the vitamin B5 might even help your skin. You could get an equivalent dosage of the active ingredient at any health products store for about US $3 for 30 capsules. Many acne products websites list Acnezine among their pills for acne. Actually, it is not a pill. It is a 5% benzoyl peroxide gel you can put on your skin to kill acne bacteria. It definitely will kill acne bacteria, but the overwhelming majority of users of this strength of benzoyl peroxide find skin irritation unacceptable and stop using the product. There are no nutritional supplements that are especially helpful treating acne. If you happen to be deficient in a particular nutrient, you will have deficiency symptoms other than acne. It’s fine to take nutritional supplements—but it is usually a mistake to pay more than US $10 to $30 for a month’s supply. Acne pills don’t cure acne—but acne systems often do. For a collection of acne care products offered with a one-year money-back guarantee, consider Exposed Skin Care.